This is a classic novelette set in the time of the French Revolution, an epoch that vividly demonstrated man's capacity for both heroism and brutality. 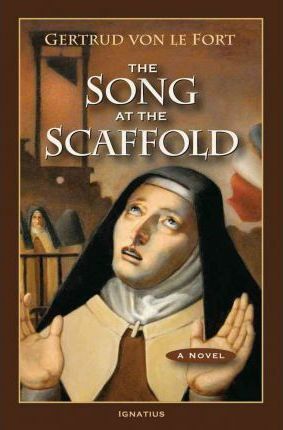 It is an intense and compelling drama based on the true story of the Carmelite nuns at Compeigne beheaded during the last few days of the Revolution, but also encompassing the Paris mob, the Reign of Terror, women revolutionists, etc., climaxing in the heroic martyrdom of sixteen Carmelites. This story unfolds around Blanche de la Force, who enters the Carmelite convent amid the horror of the French Revolution. Blanche is so timorous that she seems unsuited to the rigors of religious life even at the best of times - and badly misplaced as the Reign of Terror begins to stain France with the blood of martyrs.Sister Marie, one of the leading nuns in the convent, receives with joy the death threats of the revolutionaries: the sisters are going to be awarded the crown of Christian martyrdom! Sister Marie prepares the other nuns for this fearsome sacrifice, all the while harboring doubts about Blanche's ability and willingness to join them in dying for Christ. Blanche's life thereafter and the story of the nuns take several unexpected twists, leaving you not only with the inspiring, true witness of their martyrdom, but also with a penetrating insight into the nature of holiness. As our world is engulfed anew in terror and hatred for the Christian faith, The Song at the Scaffold will inspire us with a renewed and fervent love for God. Gertrud von le Fort attended the universities of Heidelberg, Berlin and Marburg. She was a prolific writer whose poetry and novels, which have been translated into many languages, won her acclaim throughout Europe. She also wrote The Eternal Woman.